Whatever else is going on, at least in our world - the warm, relatively comfortable world of RPGs - 2017 is looking much brighter than 2016 looked at this time last year. Torment: Tides of Numenera might be one of the most highly-anticipated RPGs of the decade so far (at least around here at the Watch), and the sequel to Larian's breakout hit Divinity: Original Sin looks quite promising. And there's so many more...hopes are high for the real-world medieval sensation Kingdom Come: Deliverance, the newest entry in the Mass Effect series, and countless more RPGs we're eager to get our hands on. Let's take a look at the games that the RPGWatch staff and community are most excited for. Torment: Tides of Numenera might be one of the most eagerly-anticipated RPGs in years. The successor to 1999's hit Planescape: Torment, this new entry makes use of the Unity engine to bring Monte Cook's Numenera universe to life, a world whose strangeness is almost beyond comprehension. Torment's writing is top-notch, as it must be to describe a world at the very edges of our ability to imagine. As of writing this, the game is just a few weeks from release, and those of us who have played it will tell you that it is shaping up to meet all expectations with outstanding quality in every category. Here on the staff, it's our most anticipated game of 2017, as well as the most anticipated game from our visitors. We can't wait. Divinity:Original Sin was RPGWatch's RPG of the Year for 2014. 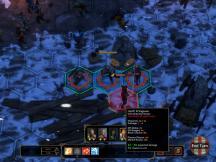 It featured an innovative combat system including a unique element system. It also featured challenging puzzles and a huge world to explore. While incredible in terms of gameplay, the story, writing and characters recieved a mixed reception. Divinity: Original Sin 2 promises the same great gameplay and seems to address the problems players had with part one, with a much larger writer team including the famous Chris Avellone, and much deeper characters and companions. Larian Studios has made a lot of good RPGs in the past, and this one will, we hope, turn out to be a future classic. After working for nearly two decades on their open world RPG franchises Gothic and Risen, Piranha Bytes got tired of making games based upon 'the Gothic formula'. So they're creating Elex, a new open world fantasy RPG - and injecting it with a healthy dose of science-fiction. This has far-reaching consequences for the game mechanics and forces creative design solutions. Combat, for example, balances swords, chainsaws and blasters. Or consider the wonderful things you can do with a jetpack in combat and exploration. Piranha Bytes promises a world significantly bigger than Gothic 3, a new morale system, and a branching storyline. Sounds like they're aiming high, and our community is optimistic they will hit the mark. Expeditions: Conquistador was a niche favorite, featuring rich RPG elements as well as a setting that brought back some of the nostalgia from 90's titles like Seven Cities of Gold. Expeditions: Viking continues in this tradition, moving the setting to the viking age and switching out exploration for richer character development, RPG freedom of choice, and story. You're more at liberty in Viking to build your character the way you want, and fight the way you want, while being constrained to a somewhat smaller map. Based on Forgottenlor's excellent preview of Viking's beta, we're pretty excited to see what the final release brings this year. The following tables show the results of the voting by our visitors and editors. All other games scored a percentage of less than 2%.